Merging your finances isn't an all-or-nothing idea. Couples can choose from many methods. Some couples commingle every bank account, retirement fund, and credit card. But that's not the only way you and your partner can combine household bills. Take a look at some examples. Couples who use the "proportional method" to commingle their finances each chip into the household bills at a rate that's proportional to their income. John earns $2,000 per month, which is 33 percent of their household's total income. Sally earns $4,000 per month, which is 66 percent of the household's total income. The couple spends $3,000 per month on their household bills, such as their mortgage, utilities, groceries, and one-twelfth on their annual expenses such as their property taxes. John earns 33 percent of the couple's combined income, so he pays 33 percent of their $3,000 monthly bill, which equals $1,000. Sally earns 66 percent of the couple's combined income, so she pays 66 percent of their monthly bill, which equals $2,000. Pros: The main advantage is that neither partner feels the pressure to "keep up with" or "budget down to" the earnings of the other partner. In other words, their income disparity doesn't cause a lifestyle clash. The couple also enjoys a "middle-ground" stage of commingled finances. They share household bills, but they also keep separate money for themselves as individuals. Cons: The main disadvantage is that the higher-earning partner might start to feel resentful, or might start to feel like they're being "penalized" for earning more. Couples who use the "raw contribution method" each chip in the same raw number, regardless of how much they make. Danny earns $3,500 a month. Kate earns $5,000 a month. Their household bills come to $4,000 per month. They each chip in $2,000 and keep the remainder of their money in separate accounts. Pros: The higher-earning partner doesn't feel "penalized" for their success, and the lower-earning partner doesn't feel "subsidized." Cons: They need an agreement about what to do if one partner's income drops to zero (for example, if one partner loses their job). Their relationship could become strained if Kate lives a more glamorous lifestyle than Danny because she has more "fun" money left over after paying the bills. Some couples also criticize this method as feeling too "roommate-like." 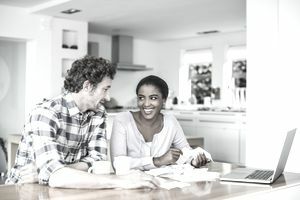 Couples who completely commingle their finances combine their bank accounts, carry only joint credit or debit cards, and list each other on their investment funds. Devon earns $3,700 a month; Hilary earns $2,600. Both paychecks get direct deposited into a joint checking account, which the couple uses to pay all their bills. The couple also carries joint credit or debit cards, which they use to pay for all of their purchases, regardless of whether it's a household purchase (like a microwave) or an individual purchase (Hilary spends $100 a month at the hair salon, while Devon likes to collect baseball cards). Pros: They unite as a single unit: "we" rather than "you" and "me." Neither partner keeps "score." If one person's income rises or the other person's income falls, they'll balance each other out. Record-keeping also becomes easier. Cons: The higher-earning partner can resent the lower-earning partner for spending his/her earnings, especially if one person tends to be a spender while the other tends to be frugal. There's no single best practice for commingling a couple's money. The most important thing is to realize that there are many methods you can use. You and your partner should weigh the pros and cons of each strategy to decide which method feels best for you. Once you choose a method, don't be afraid to tweak it or change it. You and your partner may need to experiment with different strategies before you find the "perfect balance" between your individual money and your shared couple money.